Mary remembered all these things and thought deeply about them. 'How time flies!' The summer holidays have been and gone and September brings the beginning of a new school year. Please remember in your prayers all those who are involved in the education of our children and young people. Pray for our local schools: St Mary's Infant and Junior Schools and Pittville School - for their pupils, staff, helpers and governors. As we think of those from our congregations who serve as governors we give thanks for all they do on our behalf in the schools which we support. September also sees the start of a new term for our Sunday School at St Mary's and Sunday Club at St Nicolas'. Please pray for the children who will attend, for their Christian nurture and especially for those dedicated volunteers who lead this vital work with our children. And in September our various Youth Groups restart - Twilight Zone, The Space and Synergy. This September a new group begins, called 'Elevate', which is a group for younger members - those in their first couple of years at secondary school - which will be run along similar lines to Synergy, looking at faith issues. Please pray for all the young people we will be in contact with through these groups and for all those who give so generously of their time and talents as youth leaders. As we pray for our Youth Work, we must not forget to give thanks for Andy Macauly and for all that he has brought to this area of nurture and outreach. Time has certainly flown by, because Andy is now into his third year with us! What that means is that we are now urgently seeking ways to ensure that all this excellent work can be continued after May 2003. We hope and pray that we will be able to continue to employ a full-time Youth Worker (Andy if he'll stay! ), but that will depend on securing a large amount of finance. We will need between £25,000 and £30,000 each year if we are to carry the work on. We will be applying to as many potential sources of funding as we can, but we will also need to have some funding already secured. Last time we had almost £18,000 through the Diocese, but that source is not available to us this time and we know that we face a tough challenge. But if we approach this challenge with faith and a huge amount of prayer, we must believe that God will bless us and all that we are attempting in His name. Please pray and please let us know of any potential source of funding that you might be aware of. I wonder what you think of change? In my life at the moment it seems as though change is everywhere. By the time you read this article, Sharon and I should have moved to Cheltenham, and hopefully you should see more of us both, as people. We are particularly looking forward to worshipping together in Prestbury. There is much change within the youth work too. We are starting a new group for Year 7 and 8 called 'Elevate' - a chance for young people to explore faith through discussions and creative activities. There will be changes in leadership - Sharon Macauly will be taking on the role of Team Leader for Synergy as a volunteer, while Emma Bradley will be Assistant Team Leader for The Space. A number of other volunteer workers (both adults and young people) will be starting in September. These changes and the ongoing contribution of all the volunteers to the youth work will contribute to the diversity, creativity and relevance of the work we undertake. It is also a time of change for many young people as they move from one school to another school or college. Please pray for all those with the challenge of learning in a new environment and of getting to know new friends. Please also pray for young people as they move up into new groups - that there would be a real sense of welcome and co-operation. Change is definitely all around us, but I wonder if the writers quoted above had a different kind of change in mind. Perhaps they were thinking about a change which was not so much about events around us but more about our relationship with God. It is this change, most of all, which we strive for in ourselves and in those we meet. I have been asked to write a few words about my ordination training. I suppose the first thing to say is that it is two years down and one to go. By this time next year I shall have been ordained deacon in the Parish of Prestbury for just over a month. Scarey! So what have I been up to? Well, as you can imagine, most of it is attending lectures and producing assignments. Not the most exciting things to write about really. However, one or two of the lecture courses have been particularly good and I feel very privileged to have been able to attend them. Almost without exception the good ones have involved studying the Bible. Would you believe that we studied the Old Testament in the first half of the term and the New Testament in the second? Not in depth, of course, but it served to give the whole picture - a sketch really. Now we can gradually fill in the details. It has really brought the Bible to life - not that I ever considered it dead before, but now I see it with new glasses. The other lecturing highlight was the course on the Psalms. I have always had an affinity for the Psalms, but never quite knew why. Well now I have a much better idea, and I love them all the more for it. I suppose I ought to mention the fact that we have done courses on Salvation, Doctrine, Church History, the Reformation, Liturgy and, of course, Theology. I have to admit I am not your A1 student on most of those, although the Reformation was quite exciting. We also have a number of residential weekends on a variety of topics throughout the year, usually two a term. These can be especially enlightening as the whole weekend, including the worship, is geared to the topic being studied. The days are long with Morning Prayer starting around 7.30am and Evening Prayer finishing around 9.30pm and a full schedule, apart from an after lunch break, in between. Then there is Easter School. For the last two years this has started on Easter Sunday and finished the following Sunday. It is really gruelling with each day as full as the residential weekend days except Thursday, which is a quiet day. Oh what joy! There are lectures each day and group projects built up throughout the week. The outcome of these can be a 'Theological Model' made out of lego, bits of string etc, to illustrate our thoughts on the topic we have been working on all week or an act of drama to do the same thing. Either way it is quite a challenge. Thank goodness there is usually someone with an initial idea, someone ready to plan the operation, someone to lead and ready and able hands do whatever is required. The whole task then becomes quite fun. At the end of the week there is the review. Anybody can take part and there is no pressure to do so either way. I couldn't resist it. I have done my bit there - never fear. I even rewrote the words to the Beatles 'Lady Madonna' and performed my masterpiece solo and unaccompanied. My words generally took the micky out of the lecturers - isn't it funny how students always do that! - so they were very well received. The other activities we have are Placements, which are generally longer-term tasks. The first one is a Social Placement - mine was in Bay Tree Court. I had to spend up to twenty hours talking to the residents. I then had to produce a diary of my conversations and a report reflecting 'theologically' on what I had heard. Where is God in that place? My report was marked in the normal way and I was then asked to do a thirty minute presentation on the 'Theology of Growing Old'. There were ten of us making presentations, so with discussion after each one, the whole process took another residential weekend to complete. Very gruelling but very enlightening. Others covered such places as the Law Courts, an undertaker's, a factory and the council rubbish tip. My next Placement is my Parish Placement. This starts on September 8th and lasts for two months. I shall be working in the Parish of St Luke's under the wing of Mike Lodge the vicar. At the end of that there is another residential weekend reporting back on our findings. See you all again towards the end of November. Springboard has been a nationwide project. Every parish was asked to think about its responsibility for mission, and to take at least one new step in its own local outreach. In Prestbury the Springboard story began in Lent 2001 and will finish this autumn as we conclude this year's programme based around the video of the Cheltenham Passion Play. Springboard is coming to an end, but outreach will go on. Lent 2001: 'Growing New Christians'. Small groups addressed questions about how people come to faith, and which age-groups and areas in Prestbury most need our effort. Lent 2002: Five very enjoyable evenings in the Infant School, with an unprecedented number of participants. Discussion, sharing and listening based on the video. New contacts and friendships among our own and other congregations. Sensitive and helpful guidance from a new team of group leaders. Memorable celebration supper. Palm Sunday: Procession through a large part of the village, with a short service at the War Memorial. Participation of staff, parents and pupils at St Mary's schools. Good Friday: Processional act of worship from Capel Court via Mill Street to St Mary's, followed all the way by a large audience, many from outside our congregations, who also continued into St Mary's to witness the closing scenes. Thanks to these two open air events, many people in the parish are more aware of their local church. Over the summer, and continuing, individual contacts with neighbours. More planned for early autumn. Overall, a new awareness of what mission means in a village or suburban situation, and of our individual responsibility. Honest recognition of the problems, - and of our own inadequacies. Don't underestimate the small practical tasks that are part of outreach. Deliver Christmas and Easter cards in your street. Take a turn as steward or welcomer when the church is open for a Flower Festival or Open Day. for the people you greet in the street. Pray for them by name if you know it, but pray for them anyway; they are already known to God. 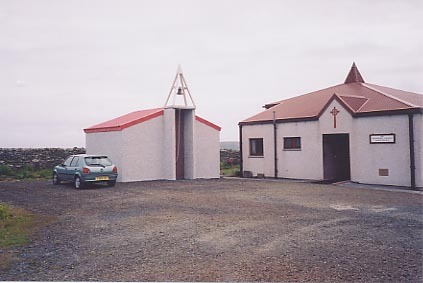 The most northerly bell tower in Britain is at Haroldswick Methodist Church on the island of Unst in Shetland. On alternate Sundays the service is in the morning or the evening and although I was on Unst on a Sunday it was the wrong sort to hear the bell rung. Once there was a gardener who had many different gardens. In some he grew flowers, in others vegetables. He was pleased with this particular garden - neat straight rows of carrots, leeks and beans were growing where he had sown seeds. In between the vegetables weeds were sprouting too, but the gardener knew that regular attention with a hoe would scratch most of them out before the garden even knew they were there. If he ignored them they would grow taller and need digging out, so he set to work immediately with the hoe. Occasionally he came across a deep-rooted dandelion, which he dug out with a small fork - a slight disturbance for the soil, nothing too painful. But there was another weed, sometimes visible in long tendrils, sometimes only a leaf or two peeping through the surface of the soil, sometimes nothing visible at all - bare earth, seemingly weed-free. The gardener knew the hoe was useless here: nothing but the largest garden fork and hours of painstaking deep, earth-turning would clear the garden of this weed - convolvulus, or bindweed. Carefully digging deep below the surface he gathered handful after handful of long white root. He dug again in the same place and revealed yet more root, the tiniest piece of which would grow again if left. Yes, that is what I found in my garden that hot July day - bindweed. And it made me think: God is like a gardener and we are his various gardens. The carrots and leeks, the pretty flowers and shrubs, are the things in our lives which God is pleased with, while the weeds are our sins. Regular, frequent contact with God ensures most sins are dealt with before they take root. Occasionally something needs a bit of uncomfortable 'digging out', like the dandelion. But what about the bindweed? Maybe there are other things in our lives which need God to dig and dig, so deep that it hurts, again and again, before we are clear. This is where my analogy breaks down: it is, after all, gardeners who choose to attend or neglect their gardens, not the other way round. But with God it is we, the 'gardens', who often neglect our relationship with him. He does not neglect us, but is always accessible and available, always willing to sort us out, if only we ask. How often have you acquired a new gizmo and thought you've got it worked out how to get it to work (or how to put it together) when you come up against some glitch and however much you yell at it, or thump it, you simply can't get it to do what the picture suggests it will do? After stopping for some tea or coffee and scratching your head a bit, it occurs to you that just maybe there's something helpful in the uninspiring black and white booklet that fell out of the box when you tore it open in your great haste to get the new gadget out and working. So you find your specs and glance at the small type written in strange English and after a bit you realise what you've done wrong and so you put it right and "Hey Presto" it's all up and running as the maker intended. Can you see a modern day parable here? If you can, and more especially if you can't, come along and join us as we refer to the "maker's manual". All meetings start at 8pm. Further clarification from Sue Read. All the sessions begin at 7.00pm with coffee and are free of charge. This is not a course, so you can choose the number you wish to attend. If you would like more information, please speak to Fr Michael. The organisers need to know numbers attending by 12th September. A day on this subject is being offered by the Spirituality Network for Gloucestershire. It will take place on Saturday 14th September from 10.00am - 3.15pm at St Philip & St James Church Centre in Hucclecote. The day costs £6 and tickets are available from The Revd Pauline Green, cheques payable to 'Spirituality Network for Gloucestershire'. Bring a packed lunch, drinks provided. The Spirituality Network runs the Introduction to Spiritual Direction Course on which Fr Michael is a tutor. Please speak to him for further information. The current threat to the Noverton environment prompted me to seek the origin of the name given to these purlieus of Prestbury's 'eastern front', which others might like to share. The earliest reference to the area given in James Hodsdon's interesting Historical Gazetteer of Cheltenham (1997) dates from the 12th century when the Bishop gave land at Prestbury called 'Overtowne' to Llanthony Abbey. This presumably identifies the 'forty acres of his fertile Prestbury estate' given by the Bishop of Hereford towards the upkeep of the refounded Augustinian Priory at Hempstead, near Gloucester, noted by Lynda Hodges in The Life Story of a Church (St Mary's, Prestbury, 1991). Hodsdon speculates that 'Overtowne' might mean either 'upper village' in relation, I suppose to the centre of the parish at the Burgage, or 'the settlement by the bank', as derived, I assume, from 'Over' (from the German 'Ufer', river bank), of which there are well-known examples in the county (Over, Ower, etc). But while that would fit the site of the Priory on the banks of the Severn, I doubt that the modest Noverton Brook, which trickles sedately through my garden, would ever have formed such a major feature of the local landscape in Prestbury as to determine its name. 'Upper village' fits the area admirably, however. Whence Noverton, then? Hodsdon dates the change precisely from 1575 - William Shakespeare was then 'creeping like a snail, Unwillingly to school' at Stratford - when some scribe wrongly copied 'atten Overtowne' as 'atte Novertowne'. And as Noverton it has remained. So did they pronounce it 'Noverton'? Among other queries which a local historian may be able to settle are the origin of the 'Cockcroft Lane', particularly as in Twentieth Century Memories of Prestbury (p.71) Ron Bowles recalls it as 'Leg of Mutton Lane'; and then there are the boundaries of Noverton which the Geographia Street Plan of the Cheltenham area locates in the fields between Upper Mill Lane and Queen(s)wood Grove! Does this mean that Noverton encroaches on Southam? And does it extend up the hill to the limits of the parish boundary at Drypool Farm? We tend to take our historic patch for granted, but perhaps we shouldn't. St Nicolas' Renewal - Progress at Last! We have decamped to the hall, the old ceiling is gone, lots of scaffolding has appeared and, if you peer between the scaffold poles, you will see that new ceiling supports are being put in place. There is still some way to go with the renewal and we are currently predicting that the church will be handed back to us at the end of October (a slip of 3 weeks due to problems getting scaffolders), after which it will be 2-3 weeks before we can resume services. We are pleased to announce the appointment of Mr Ian Higginson, FTCL, FLCM, to the above post with effect from 1st October. He will be well-known to many local people in his capacity as conductor of the Cheltenham Choral Society. The above ministry is holding 'The Bible Comes To Life Exhibition' at St Matthew's Church, Clarence Street, from 5th to 10th October 2002. We have been approached by the organiser to see whether Prestbury would take the responsibility of manning one of the ten display stands during that week. The times in question are: 14.00-16.30 and 19.00-22.00 respectively. Having taken part in this exhibition many years ago when it came to Stow on the Wold, I can recommend it to you all as a very interesting and worthwhile project. If you could help at any of the sessions during the week I would be very pleased to include you on a rota. Contact me at St Mary's or Beryl Elliott at St Nicolas'. If you cannot help I would recommend that you try to visit it whilst it is in Cheltenham as it gives a very good insight into Judaism. The 20th Sponsored Ride/Walk will take place on Saturday 14th September. Churches and chapels of all denominations will be open across the diocese between 10am and 6pm, so you can plan your route through the town or across the countryside, visiting as many or as few as you like. If you are unable to participate, then please consider sponsoring someone else. Half the money raised goes to our own churches, the other half to the Trust to help any church in the diocese. Further details are available from Bob Lyle or Nigel Woodcock. We shall NOT be holding a bake stall in church in September. Instead we invite everybody to contribute a cake or other baked item to our cake stall on Saturday 7th September at the Jubilee Celebrations on Prestbury Pavilion Playing Field. Thank you to all box-holders at St Mary's. The total collected this year was £432.42. Our last concert in St Mary's this season is on Wednesday 25th September, and will be a Violin and 'Cello recital given by Jane and John Stilwell. Coffee will be served at 10.30am and the music will start at 11 o'clock. There will be a retiring collection in aid of church funds. Fr Stephen is looking into the possibility of leading a spiritual visit to some of the early Holy Places probably in mid-February when it is quiet and the weather usually fairly mild. Please let him know if you are at all interested. I am very grateful to Andrea Jackson, who has organised and led a series of informal Rockers sessions in St Mary's during the summer holiday. Term starts on Thursday 12th September at 2 o'clock in St Mary's church. This short informal service is ideal for all people (parents, grandparents, child-minders) who look after babies and pre-school children during the day. Come along and join us for a few action songs, a short bible story, a cup of tea and the opportunity to meet others. We finish by 2.45pm so that there is time to get to school if you need to meet older children. Please note that the initial training session being run by ACCORD will now take place on Tuesday 10 September at 7.15 for 7.30pm in St Nicolas' Church Room and not on 17 September as given in the July/August Magazine.